While Nintendo is crafting many new games and winning people over with the power of the Switch, a good deal of their hand-over-fist moneymaking is coming from ports of things that may have been forgotten on Wii U. Mario Kart 8 Deluxe has sold more than it's predecessor. With that, it appears that other companies may be getting a clue and pulling out their back catalog. 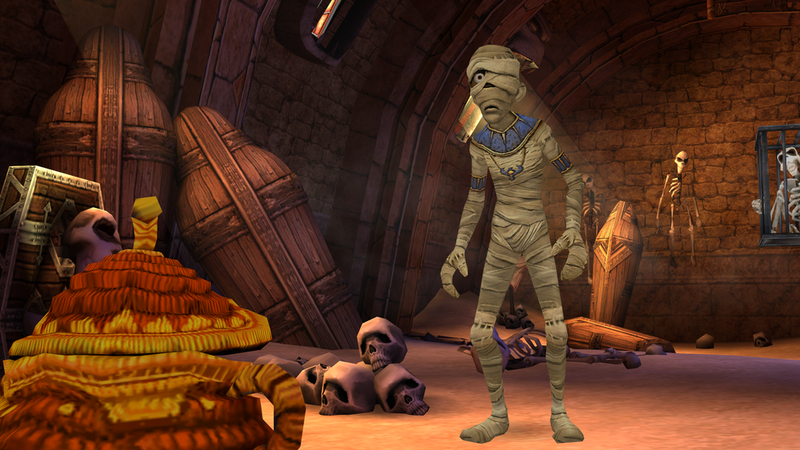 THQ Nordic Games has followed suit with Sphinx and the Cursed Mummy, a port over of a Steam release in 2017 from two console generations back. You play as the two titular characters, Sphinx (a demigod in training) and Prince Tutankhamen (tricked into mummification by his brother). The two play styles portray a very Zelda 64/Twilight Princess vibe as you platform your way through areas, solve puzzles, and battle enemies to reach your goal. 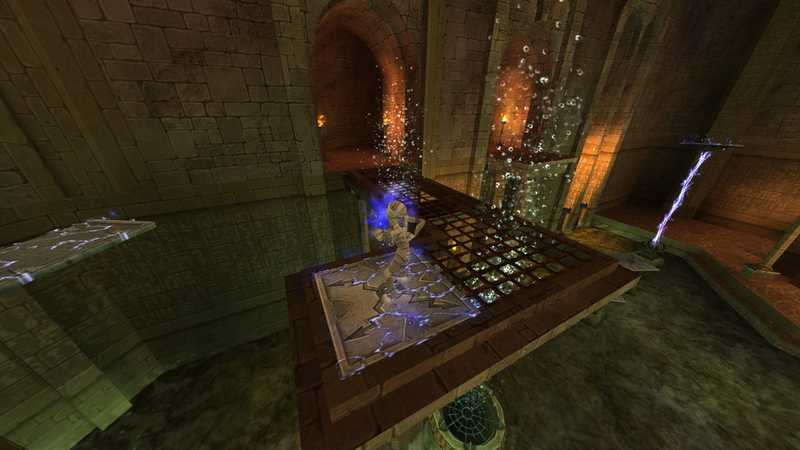 Sphinx plays more naturally as he uses his sword and brains to proceed, whilst Tut is unique in that he cannot die and you frequently have to use that invulnerability to squish, bend, and light him on fire to get through some more difficult puzzles. Sphinx is a direct port. Save some polishing up on the graphics that comes by default (better resolution and a steady and clean FPS) this is the same game that was released back on PS2, Xbox, and GameCube. Therefore, it comes with all the shortcomings it did back in the day. While Sphinx is a great title for it's generation, there are several quality of life issues that we've fixed since 2003. With no lock-on for Sphinx's blade and a slightly wonky camera that kind of half-follows it can be frustrating taking on large groups of enemies. Cutscenes involve characters standing around and mouthing whilst text runs on screen. It isn't necessary to have a fully voiced cast, but it does date the title a bit. Tut and Sphinx have to solve puzzles that come from a vaguer time. Even in the first area I felt I knew what I was getting into as I needed to get up a wall. Well, I had to get thrown up there. Well, to do that I had to satisfy a monster with coconuts. Which were in a tree. That I had to figure out how to knock down. Only to get to the top, get one little key that allowed me to walk down a hallway to open another lock back at the beginning. I get that the game is primarily focused around puzzles, but I do get frustrated at the dated mechanic of multiple fetch quest chains. As you advance you do learn new powers and abilities, so there is a sense of character progression as well. At the time of original release, Sphinx was a pretty neat release and a chance to get a Zelda-feel game on multiple platforms. As I research, I am learning that the developers originally had plans for a sequel, if not an entire series. Perhaps this release serves a double purpose: quick easy cash for an older game and testing the waters for a new one. With the Steam edition running for half the price (let alone used copies of the original disc at a quarter of the new price) it's hard to validate unless the Switch is your only option, but it's also a little bit of classic gaming for half the price of a new game. In the end, either you played this game back in the day and know exactly what you're getting into or you may be too young to remember releases on those platforms and might be put off by the simpler things that have been polished in releases since. However, Sphinx still holds ground as an enjoyable title. It's definitely an odd one to get a rerelease, but one I can see developers pushing the envelope on with a sequel that fits right in with the AAA crowd. If this mummy can rise from the grave and start a new franchise we could be in for quite a treat. Special thanks to THQ Nordic and Eurocom for providing a digital copy for review!